Here is a post listing note on Bharat 22 ETF (BH22). The BH22 is an open-ended index ETF which listed on 28th Nov, 2017. The investment objective is to provide returns like the S&P BSE Bharat 22 Index. The NFO received the highest subscription for any new fund offer (NFO) in the history of Indian MF industry. The ETF was subscribed about 4 times as the amount to be raised was Rs. 8,000 cr. and it received applications for around Rs. 32,000 cr. The NFO attracted 3.35 lakh retail investor applications. Due to the excellent response, the ETF issue size was raised to Rs. 14,500 cr. A NFO discount of 3% was offered to all investors including retail, retirement funds, QIBs and non-institutional investors. Retail investors who applied with Rs. 2,00,000 (Retail cap) were allotted 5,560 units at Rs. 35.97/unit (including the 3% discount). Retail applicants appear to have received 100% allotment this time. Currently the ETF is trading at Rs. 37.42 translating into a gain of 4.03%. This means any retail investor who applied for the max. allowable limit of Rs. 2,00,000 has notionally gained Rs. 8,060. This is because of the discount as well as rise in the S&P BSE Bharat 22 Index. This ETF is set to create good value for the investor as profit making PSUs, PSUs undergoing reforms and private sector firms have been bundled together. ETFs are also advantageous in terms of management costs & liquidity. Also with the discounts given in BH22, we feel that this is a good long term buy for low risk equity investor and is comparable to the Balanced MFs. If you have missed out Bharat 22 ETF in the NFO, you can also BUY it from the open market. Investors can BUY with a 3 year perspective. This document has been prepared by JainMatrix Investments Bangalore (JM), and is meant for use by the recipient only as information and is not for circulation. This document is not to be reported or copied or made available to others without prior permission of JM. It should not be considered or taken as an offer to sell or a solicitation to buy or sell any security. The information contained in this report has been obtained from sources that are considered to be reliable. However, JM has not independently verified the accuracy or completeness of the same. Punit Jain discloses that he holds a position in BH22 ETF as a successful Retail applicant in NFO. He may also hold positions in some of the constituents of the ETF. Other than this JM has no known financial interests in BH22 ETF or constituent firms. Neither JM nor any of its affiliates, its directors or its employees accepts any responsibility of whatsoever nature for the information, statements and opinion given, made available or expressed herein or for any omission therein. Recipients of this report should be aware that past performance is not necessarily a guide to future performance and value of investments can go down as well. The suitability or otherwise of any investments will depend upon the recipient’s particular circumstances and, in case of doubt, advice should be sought from an independent expert/advisor. Punit Jain is a registered Research Analyst and compliant with SEBI (Research Analysts) Regulations, 2014. Any questions should be directed to the director of JainMatrix Investments at punit.jain@jainmatrix.com . Raising Fund: Rs. 8,000 cr. Overview: The BH22 is PSU heavy open-ended ETF scheme. The BH22 will cover 6 sectors and 22 firms including PSUs, PSBs and a few blue chip private firms. BH22 has a 20% cap on each sector and a 15% cap on each stock. The Rs 8,000 crore NFO is available at a discount of 3% on the Reference Bharat 22 Index. The BH22 appears better than CPSE on several counts like sector diversity, balance and higher mkt cap. firms. Risks: 1) There is no strategic clarity on GoI shareholding in these firms – will they be fully divested, or a strategic sale, or as JVs, or retained with GoI majority holding in the long run. 2) There is Political risk as a surprise election result could affect PSU firms. Opinion: Investors can SUBSCRIBE to this ETF offering with a 3 year perspective. See our past coverage of CPSE ETF NFO in Mar 2014, review in Sept 2015, the CPSE ETF FFO in Jan 2017 and a Video, and finally the CPSE ETF FFO 2 in Mar 2017. The BH22 is an open-ended index ETF which is going to be listed on the Exchanges. The investment objective is to provide returns like the S&P BSE Bharat 22 Index. The amount to be raised is Rs. 8,000 cr. The BH22 consists of 22 blue chip Govt. of India (GoI) holdings including PSUs, Public Sector Banks and the strategic holdings of GoI through SUUTI (Specified Undertaking of Unit Trust of India). BH22 is the 2nd ETF from GoI after CPSE ETF launched in 2014. Both these will speed up GoI’s disinvestment plans. The BH22 will cover 6 sectors of basic materials, energy, finance, FMCG, industrials and utilities. The SUUTI firms (L&T, ITC and Axis Bank) have a 40% weight on the index. Other big names include SBI, Power Grid, NTPC and ONGC (5-9% each). The ones which would have a lower weight include NALCO, Indian Oil, Coal India, Bharat Electronics, Bank of Baroda, NBCC, Indian Bank and SJVN. NFO price: The NFO Units being offered will have a FV of Rs. 10/- each and a premium of the difference between NFO Allotment Price and the FV. The NFO Allotment Price would be equal to 1/100th of S&P BSE Bharat 22 Index less discount. In this offer 25% each is reserved for 1) Retail 2) Retirement Funds 3) QIB / NII and 4) anchor investors. Discount: A discount of 3% on the NFO Reference Market Price of the underlying shares of S&P BSE Bharat 22 Index shall be offered to NFO of the Scheme by GOI. The scheme is being managed by ICICI Prudential Asset Management Company Ltd. Asia Index will be the index provider and the index will be rebalanced annually. The Scheme will invest at least 95% of assets in stocks of the Bharat 22 Index. It may invest in safe Money Market Instruments upto a max. of 5% of assets. The AMC will use a passive or indexing approach to achieve the Scheme’s investment objective. Here are Sectoral Asset Allocation, Historic Returns and Analysis of the 22 companies as part of this ETF. 15 of the 22 firms are Large Cap giving some stability to this ETF composition. Dividend: The Trustees may declare Dividend to Unit holders subject to the availability of surplus, at their discretion. If the Fund declares Dividend, the NAV will stand reduced by that amount. Minimum Investment: It is Rs. 5,000 and in multiples of Re. 1 thereafter, with a maximum amount of Rs. 2 lakhs in retail category. Non Institutional Investors and HNIs may apply for over Rs 2 lakhs. How to apply: You can apply via your broker or via the AMC (iciciprumf.com). Listing:The units of the Scheme will be listed on NSE and BSE within 5 days after allotment. The allotment date of Units will be within 5 business days of offer application period. There may be an additional offering depending on NFO response. How has the CPSE ETF performed so far? From an issue price of Rs. 17.5/unit in March 2014 (for Retail), the CPSE trades at Rs. 30.4 giving a gain of 21% simple annual. The CPSE ETF FFO 2 launched in Jan 2017 had allotment at Rs. 25.21, giving a gain of 20.6% (in 10 months). So the energy focused ETF has so far generated above Index average returns. The CPSE ETF comprised 10 PSU stocks from the Oil & Gas and energy sector. However the BH22 ETF is diversified among 6 sectors and 22 firms with a 20% cap on each sector and a 15% cap on each stock. Hence this ETF is more balanced across sectors and firms. The GoI has cherry picked stocks which are into sectors where large reforms are underway. This fund even includes Private sector firms like L&T, ITC and Axis Bank. The CPSE ETF fund is larger. It has raised Rs 11,500 in 3 offerings from 2014 – 17. This ETF has a lower management charge and the expense ratio is 0.0095% of daily average net assets. Also the maximum recurring expenses that can be charged shall not exceed 1.5% of daily net assets. The fund will offer 3% discount to the NFO subscribers. The 5 year share returns are 13.8% CAGR as against Sensex of 13.9%. See Fig 3. However the 1 year performance has been better at 22.5% as against 20.5% for Sensex. Dividend yield for the stocks is 2.42% which is moderate, but higher compared to Nifty/Sensex, see Fig 4. The constituents of BH22 have a lower P/E & P/B as compared to Nifty 50/S&P BSE Sensex. See Fig 5. The BH22 is diversified among 6 sectors with caps by sector and by stock. This gives leverage in the form of both secular & cyclical growth prospects. Like the CPSE, the BH22 may be popular among Pension Funds, new equity investors and retirees. Many of the firms have wonderful assets, the family silver of the GoI. Some even enjoy monopoly status in their sectors. With a resurgence in GoI governance and programs such as ‘Make in India’, Bank Recapitalization and focus on Defense and infrastructure, many firms have good prospects. GoI is asking for higher dividends from PSUs and allowing them operational freedom to exploit assets and be more productive. This will benefits investors also. See report, A Repurpose for our PSUs. There is no clarity on the future of GoI shareholding in these firms – will they be fully divested, or sold in a strategic sale, or expanded into JVs, or simply retained with GoI majority in the long run. This BH22 ETF based divestment by GoI, like the CPSE, is likely to be repeated at a future date. We are not sure if the high dividend paid by the PSUs will be passed on to the unit holders (either as NAV gain or Dividend) or used for recurring expenses, as per NFO document. The CPSE ETF 2014 too has not paid dividend for 3 years. The 2.42% dividend yield in BH22 involves substantial monies. The average beta of these stocks is 1.28 indicating higher volatility than indices. These stocks performance depends on revenue growth, which has been inconsistent in recent years. Many of these firms depend on GoI policies and monopoly situations to grow. Some are externally constrained by weak infrastructure that hampers distribution. Any unexpected election results at the State or Center can delay reforms and affect BH22 performance. A few firms are into financing power projects. The power sector is yet to see a revival and NPAs here are a key concern. As long as this problem is not resolved, these firms may face financial troubles. Within the energy basket, there are upstream and downstream oil firms. Upstream firms do well when crude prices rise as their realizations go up, whereas downstream firms do well when crude falls as margins expand. The energy basket might be balanced, but together these firms may do just average. Coal India recently hiked wages by 20%. Also there is a pollution aspect to coal usage. The share has performed badly. Any adverse government reforms could impact its financials in the short term. ITC is a firm that is mainly into cigarette sales. This is a harmful product and in USA the industry players are in a sunset mode due to legal action – class action suits and massive penalties for compensating unwell consumers and their families. The BH22 appears better than CPSE on several counts like sector diversity, balance and higher mkt cap. This ETF is set to create good value for the investor as profit making PSUs, PSUs undergoing reforms and private sector firms have been bundled together. Given the advantage of an ETF in terms of cost & liquidity along with the discounts given by the GoI, we feel that the BH22 ETF is a good long term buy for value conscious investors. This product appears attractive to the low risk equity investor and is comparable to the Balanced MFs. Risks – lack of strategic clarity on PSU firms, and Political – a surprise election result could affect PSUs. This document has been prepared by JainMatrix Investments Bangalore (JM), and is meant for use by the recipient only as information and is not for circulation. This document is not to be reported or copied or made available to others without prior permission of JM. It should not be considered or taken as an offer to sell or a solicitation to buy or sell any security. The information contained in this report has been obtained from sources that are considered to be reliable. However, JM has not independently verified the accuracy or completeness of the same. Punit Jain may hold a position in several of the stocks mentioned in this report. He also holds an interest in CPSE ETF since NFO in 2014. Other than this JM has no known financial interests in BH22 ETF. Neither JM nor any of its affiliates, its directors or its employees accepts any responsibility of whatsoever nature for the information, statements and opinion given, made available or expressed herein or for any omission therein. Recipients of this report should be aware that past performance is not necessarily a guide to future performance and value of investments can go down as well. The suitability or otherwise of any investments will depend upon the recipient’s particular circumstances and, in case of doubt, advice should be sought from an independent expert/advisor. Punit Jain is a registered Research Analyst and compliant with SEBI (Research Analysts) Regulations, 2014. Any questions should be directed to the director of JainMatrix Investments at punit.jain@jainmatrix.com. Raising amount: Rs. 2,500 cr. Overview: The Scheme is a further follow on issue (FFO 2) after the January 2017 offer which was successful. CPSE ETF facilitates GoI’s initiative to disinvest stake in CPSEs through the ETF route. Past performance of CPSE ETF 2014 has been good with 19.2% CAGR over 3 years. A discount of 3.5% on the “FFO Reference Market Price” of the Nifty CPSE Index shall be offered in this Scheme. There are high sectoral risks in Oil and Gas sector with a commodities play. Also typically the asset rich PSUs are slow moving firms with a poor, lethargic culture. However overall the offer is attractive and rated a BUY with a 1 year perspective. Advice: This is a medium risk, medium return offering suitable for conservative investors. Buy with a 1 year perspective. Here is a note on the CPSE ETF FFO 2 offer 2017. There is a small change in the allocation to the 10 companies of the Index, with PSU firms having more central govt. holdings getting a few % higher allocations. The Scheme is an open-ended index scheme, listed on the Exchanges in the form of an ETF. The investment objective is to provide returns like the Nifty CPSE Index. In this offer 70% is reserved for Retail and QIB, while max 30% is for Anchor investors. The CPSE ETF 2017 has been created to help in GoI disinvestment of PSUs. The Further Fund Offer (FFO) launched in Jan 2017 received good response; collections were Rs.13,742 cr., out of which Rs.7,742 cr. was refunded to investors due to limited issue size of Rs.6,000 cr. The ten PSUs’ included in the ETF are known high dividend, low capital gains, asset rich firms. FFO Price: The FFO Units being offered will have a face value of Rs. 10/- each and a premium equivalent to the difference between FFO Allotment Price and the FV . The FFO Allotment Price would be equal to 1/100th of Nifty CPSE Index less discount. Discount: A discount of 3.5 % on the FFO Reference Market Price of the underlying shares of Nifty CPSE Index shall be offered to FFO of the Scheme by GOI. A discount of 5% was offered to retail investors in the first FFO in Jan 2017 which has been reduced to 3.5% this time. The scheme is being managed by Reliance Nippon Life Asset Management Ltd. Amount to be raised: Rs. 2,500 cr. The Scheme will invest at least 95% of assets in stocks of the Nifty CPSE Index. It may invest in Money Market Instruments upto a max of 5% of assets which could include T-Bills, commercial paper of public private sector corporate entities, etc. The AMC will use a passive or indexing approach to try and achieve Scheme’s investment objective. Unlike other Funds, the Scheme does not try to beat the markets they track and do not seek temporary defensive positions when markets decline or appear overvalued. Note 3: When we say price is high, it is relative to 5 year historical prices. We have not done valuation exercises on these firms. Portfolio Turnover: It is expected that there would be a number of Subscriptions and Redemptions on a daily basis. Portfolio Turnover Ratio of the Scheme is 1.02 as on Feb 28, 2017.
Dividend: The income received by way of Dividend shall be used for recurring expenses and redemption requirements or shall be accumulated and invested as per the investment objective of the Scheme. The Trustees may declare Dividend to the Unit holders under the Scheme subject to the availability of surplus, and at the discretion of the Trustees. If the Fund declares Dividend, the NAV of the Scheme will stand reduced by that amount. Listing: The units of the Scheme will be listed on NSE and BSE by maximum April 7, 2017. RGESS Eligibility: Investments made by a Retail Individual Investor in the RGESS Scheme will qualify for a 50% deduction of the actual amount invested from the taxable income of the financial year. The ETF structure is explained below. We had published a report on the FFO (Further Fund Offer) of CPSE ETF on 14th Jan, 2017. And recommended a BUY with a 1 year perspective. You can have a look at the report on the following LINK and the video on this LINK. Subscription response: The Reliance Mutual Fund managed CPSE ETF opened for applications from 17-20th It was subscribed by 2.30 times, with bids worth Rs13,802 cr. coming in against the issue size of Rs 6,000 cr. The FFO received 250,000 applications, with good demand across investor segments. Performance: The EOD closing price on the exchange was Rs. 27.71 today, i.e. 13thMar, 2017. This translates into a gain of 9.9% in 1.5 months. This ETF has a lower management charge as this automatic. The expense ratio is 0.065% annualized. The fund will offer 3.5% discount to the FFO 2 subscribers. 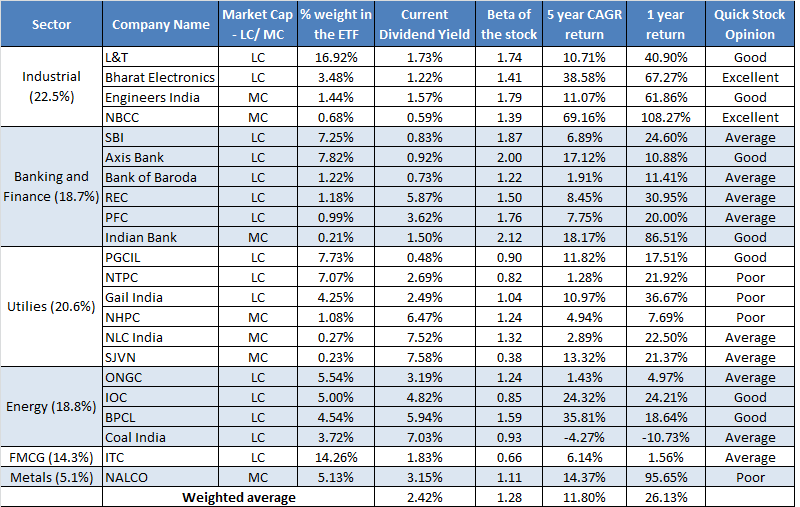 The 5 year share returns are 7.47% CAGR, see Table 3. This is fair but below Sensex of 10.63%. The dividend yield for these stocks is 5.18% today which is good, Table 3. The average beta of these stocks is 1.15 indicating higher volatility than indices. Many of these firms own wonderful assets, the family silver of the GoI. Some of these firms also enjoy monopoly status in their sectors. See our opinions in Table 3. The crude oil price fall from USD 100+ levels to sub 50 per barrel is complete. While it is volatile, crude in next 1 year should be in USD 40-60 range. If it does, the Oil & Gas sector can perform well. This fund is Oil and Gas heavy with 57% weightage. However it does have a mix of upstream, mid and downstream O&G firms, which together can de-risk the portfolio against commodity volatility. This third fund raising is an opportunistic attempt by GoI to raise funds in FY17 based on the good market conditions and the success of the Jan 2017 offer. However every successive offer dilutes incremental gains and novelty of the offer. This dilution is being run in parallel with stock level dilution efforts like the Offer for Sale (OFS) with Bharat Electronics and Engineers India. There is no strategic clarity on GoI shareholding in these firms – will they be fully divested, or a strategic sale, or as JVs, or retained with GoI majority holding in the long run. While the expense ratio of the ETF is low, the high dividend paid by the PSUs is not being passed on to the unit holders, but used for recurring expenses, as per FFO document. The CPSE ETF 2014 too has not paid dividend for 3 years. The 5.18% dividend yield involves substantial monies. It’s not clear if dividends have contributed to the NAV of the CPSE ETF 2014. This fund is O&G heavy with 57% weightage. If one extends the description to Energy/Coal/ Power/ Oil & Gas and related financing, it increases to 90%. These sectors are essential to the economy, but are typically operationally constrained and not shareholder friendly. They are dependent upon global prices, and so even well managed firms can swing to losses with a fall in commodity prices. In Oil & Gas sector, the upstream Oil Exploration firms have been hit by falling crude oil prices. The CPSE ETF is upstream Oil & Gas heavy with ONGC having 25% weightage. Even though Gail India has a monopoly, it has been hit in pipeline construction by interstate politics, farmer /social pressures and weak infra execution environment. PFC and REC are executors of GoI programs in power sector. Their returns are sometimes guaranteed by GoI but when the entire sector gets stressed, they can suffer poor performance. Many of these firms depend on GoI policies and monopoly situations to grow. Some are externally constrained by weak infrastructure that hampers distribution (Railways for coal, pipelines for gas). This CPSE ETF 2017 offering is managed by Reliance Mutual Fund. The current govt. is focusing on good execution and better administration with a series of reforms. The environment is more result oriented with less political interference in PSUs. The outlook for Oil & gas sector is stable this year. Domestic demand is high. Past performance of CPSE ETF 2014 has been good with 19.2% CAGR over 3 years. There are high sectoral risks with an Oil & Gas heavy commodities play. Also typically the asset rich PSUs are slow moving firms with a poor, lethargic culture. However overall the offer is attractive and rated a BUY with a 1 year perspective. This is a medium risk, medium return offering suitable for conservative investors. This document has been prepared by JainMatrix Investments Bangalore (JM), and is meant for use by the recipient only as information and is not for circulation. This document is not to be reported or copied or made available to others without prior permission of JM. It should not be considered or taken as an offer to sell or a solicitation to buy or sell any security. The information contained in this report has been obtained from sources that are considered to be reliable. However, JM has not independently verified the accuracy or completeness of the same. Punit Jain holds CPSE ETF units since NFO in 2014. Other than this JM has no known financial interests in CPSE ETF / Reliance Mutual Fund or any related firm. Neither JM nor any of its affiliates, its directors or its employees accepts any responsibility of whatsoever nature for the information, statements and opinion given, made available or expressed herein or for any omission therein. Recipients of this report should be aware that past performance is not necessarily a guide to future performance and value of investments can go down as well. The suitability or otherwise of any investments will depend upon the recipient’s particular circumstances and, in case of doubt, advice should be sought from an independent expert/advisor. Punit Jain is a registered Research Analyst and compliant with SEBI (Research Analysts) Regulations, 2014. Any questions should be directed to the director of JainMatrix Investments at punit.jain@jainmatrix.com .